Here at Attack the Back we are all about MMA and BJJ. It doesn’t matter what level you’re at, we want to hear from you and we want to help you. We are completely focused on all areas of the sport, from professionally to amateur and everything in between. The growth of the sport from the early 90’s has gone from beyond the televised sphere and is now a popular sport within gyms across the world. There are a bunch of MMA-related techniques that you can transfer from the cage to your fitness regime, and they don’t need to be solely restricted to training for a fight. These can be used as a great fitness boost and an inventive and interesting way to change up your workout routine. Find below some of our top tips to transform your at-home MMA fitness regime. If you live in a home with stairs, as most of us do, you’re missing a trick if you’re not combining these with your current fitness regime. According to the American Council on Exercise, running up and down your stairs is a better way to raise your fitness than jogging and cycling. The reason being that it is a great cardiovascular exercise and tones your legs, too. A core principle of MMA is movement from the legs upwards, so whereas with boxing legs are used for movement and speed is required, in MMA your legs are a weapon, so strengthening them is a major objective in your routine. Yoga isn’t merely about relaxation and calming yourself. One of the best things about it is that it works your core and helps you hone your balance, and it’s something you can do at home really easily. There are plenty of online instructions, videos and tutorials that can show you the basics of the practice simply. It’s not hard to do, but it is difficult to get really good at. Which you should see as a challenge, not as something that will demotivate you. Once you start mixing with your other pieces of exercise, you’ll start feeling a great benefit. The US Library of Medicine report into yoga concludes that it’s as good as or better than other health-based routines. The balance aspect of yoga will help if you’re training for a fight because of the amount of time you spend moving, specifically on either one of your feet. Push ups are a great way to create strength using just your body weight. If you have the space in your home, you should be doing push ups. Upper body strength and arm strength is really important for MMA training, and using your natural body weight will certainly improve your ability as a starter. Pull ups are great because they force you to create strength in your core through your stomach muscles, eliminating fat and toning your upper body in the process. The pull up towards your knees and feet comes from having strong stomach muscles. This type of toning is important to your MMA training as it is the bread and butter of any fighter or trainer. 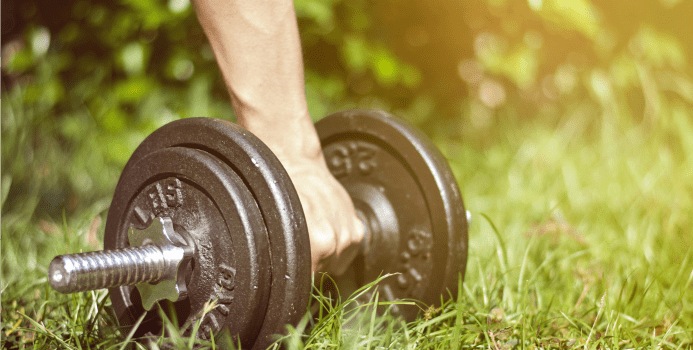 This may sound crazy, but the strength you need to do a lot of your garden chores will help you gain additional muscle mass, something really important for MMA. It’s not going to have too much affect on how far you can run or how long you can last in the ring, but it will certainly improve strength in your muscles. If you use any major improvements in your garden as a bonus exercise stream, you will be the better for it. Cutting down trees, cutting up trees and trimming your lawn could all work up a sweat, especially if done on a hot day, or done at the beginning of your training period. Even pulling up weeds as opposed to using a gas weed eater can help work up a bit of a sweat. DIY isn’t too dissimilar to the gardening section above, as it involves lots of lifting, tooing and froing. DIY is really hard work, and depending on exactly what you’re doing, you may well end up getting quite the workout. Use this as a great chance to do some of the work you’ve been avoiding. The only thing you need to make sure you’re doing correctly is the lifting itself, otherwise you might end up doing yourself more harm than good. One of the simplest lifestyle changes you can make that will affect your fitness, and it’s something that will really help your base health more than anything else. If you would usually drive to the store or drive to work, and it’s within a reasonable walking distance, then why not take a walk? In 2013, scientists in Holland found that walking long distances was often more beneficial than gym work and it improved blood lipid levels, something which changes for the worse if you show signs of obesity. You are unlikely to be obese if you are training for MMA, but it doesn’t hurt to add an extra level of fitness and raise your heart-rate more than you would driving. Although this might not be something you do in your everyday life, it’s something that you can add to your everyday life while you’re waiting for other things to complete. While you’re waiting for tea to cook, grab a skipping rope and improve your speed and fitness. Washing to finish? Same again. There’s so many times in our lives that we can be doing other things, waiting around. If you can utilise these times to your advantage, your fitness will improve. Speed and muscle mass are both huge parts of becoming a good MMA fighter, and skipping will improve you in each other these aspects. This is something you can do really easily. As an athlete, sleeping is very important. The likes of Lebron James state that “Sleep is the most important thing..” in recovery and fitness, and giving your body the best possible chance to rejuvenate itself between working out will only make your workout succeed further. Sleeping earlier will mean that you’re getting up earlier, and doing this gives your body even more chance of recovery between sessions. As MMA training is gruelling on your body, recovery time is essential. Make sure you’re using sleep properly in your routine and giving yourself the right amount of rest should be a part of your daily life you take advantage of. These are all easy pieces of advice to stick to if you’re dedicated enough to do them. Training doesn’t need to be all expensive kit and days down at the gym. It is important in MMA to be sparing with a pal and getting your speed up to standard with opponents, but while you’re not doing this, these additional home-friendly workout sessions are the ideal filler. Be sure to integrate these into everyday life.